Get the exact service & supply plan your business needs. If you order your ink, toner, and printer supplies through a big-box online retailer, chances are good that you're spending too much money (and time) on your office equipment. After 30 years of experience dealing and servicing office equipment, you could say we've learned a thing of two in identifying cost-saving opportunities that will not only increase your business efficiencies, but grow your profitability, too. At the heart of our Managed Print Services solution is a genuine desire to provide our customers a service plan that's tailored specific to their unique usage habits and needs. Whether you have 1, 50 or 500 machines, Quality DOS is committed to crafting a service plan that fits your business exactly. Curious about how much money you could be saving? Contact us for a free evaluation. 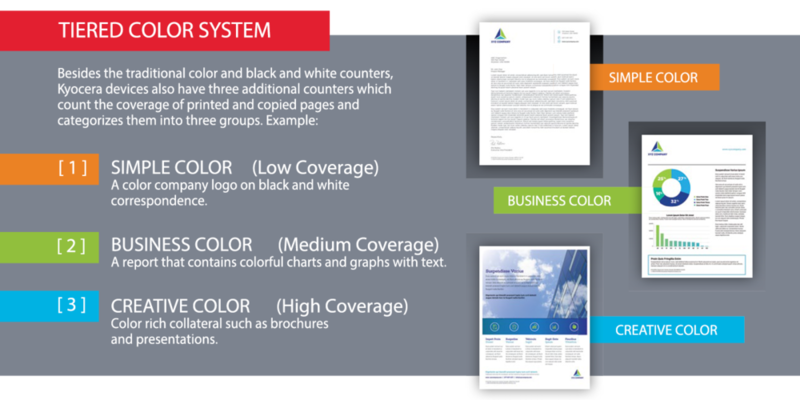 Don’t let the fear of color costs keep your invoices, letterhead or presentations from looking their best. Contact us to schedule a free on-site print assessment and to learn more about how 3-Tiered Color can help your business stand out. Kyocera Fleet Services is an IT professional's dream come true. Utilizing comprehensive remote monitoring and diagnostic tools, KFS enables you to keep your Kyocera equipment up-to-date without disrupting your workflow – saving you time and money in the process.